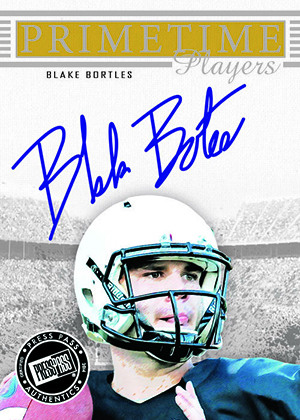 2014 Press Pass Gameday Gallery Football is an all-autograph release focusing on players in the 2014 NFL draft. Boxes come with five cards, all hard-signed. 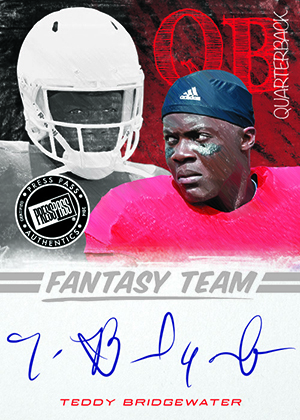 Signers for the set include Johnny Manziel, Blake Bortles, Teddy Bridgewater, Marqise Lee, Jadeveon Clowney and more. Base autographs come with a horizontal design that has plenty of white space to hold the signatures. Inserts in 2014 Press Pass Gameday Gallery Football include Fantasy Team and Primetime Players. Both use foil in their designs. See the 2014 Press Pass Gameday Gallery Football checklist here. 2014 Press Pass Gameday Factory Sealed FB Hobby Box Jimmy Garoppolo AUTO ?